Value of card: Overbidding in the Showcase Showdown on "The Price is Right"
Just in time for the MLB playoffs, it's V.J. Lovero Showcase Week: When talented Sports Illustrated photographer V.J. 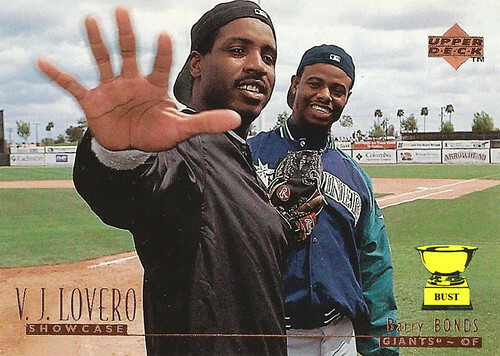 Lovero died in 2004, he left behind many great baseball images, as well as one of the most ridiculous baseball card subsets of all time, the 1996 Upper Deck V.J. Lovero Showcase. This week, we're highlighting seven of the most absurd shots from that collection, all intended to show MLB stars at their most colorful (and we all know how well that's turned out before). Something's amiss: There's something unusual about this card, but we just can't put our finger on it. It's not Griffey, with his hat turned backward, smile on his face the Kid always seemed to be smiling in the mid-'90s. It's definitely not Barry, waving away a member of the media with a look of displeasure. That's par for the course. It's not even that ad on the fence for Arrowhead Water, so cool and refreshing after a day (OK, three innings) of patrolling the outfield during a spring training game. Wait a sec ... spring training ... that's it! A cloudy day in Phoenix? Unheard of. What, did it start raining toads next?